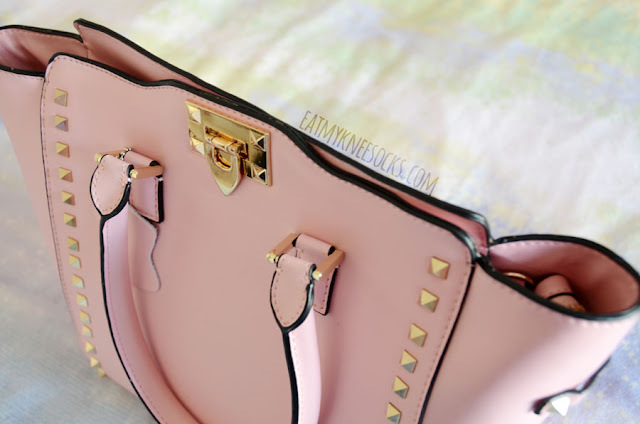 I've seen tons of reviews of BagInc and their stylish, trendy bags, so I'm incredibly excited to be reviewing their pink Rockstar calfskin leather bag! This bag, made of real calf leather, costs $119, a relatively inexpensive price for the quality and style. The bag shipped out quickly and was packaged nicely. It comes with dual shoulder straps and an additional attachable strap, a zipper closure with a front flip lock, and golden studs and hardware. The inside is lined with fabric and has pockets on both sides, including a zip pocket on one side and two slip pockets on the other. BagInc specializes in selling designer-inspired, fashion-forward bags. They've got a bunch of reviews online, from YouTubers to bloggers to regular customers alike, with mixed ratings overall. I, for one, am really happy with this bag! 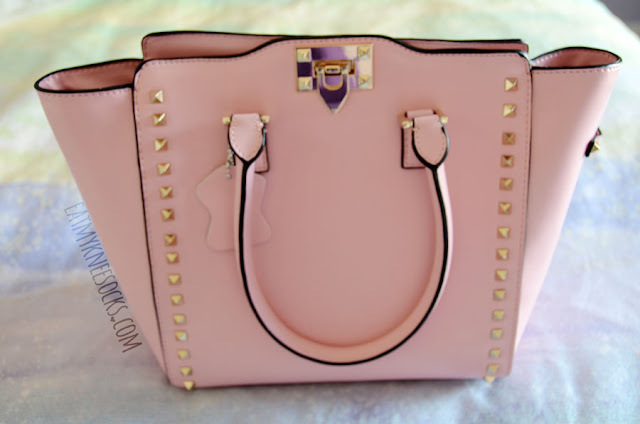 This pink calfskin leather bag is well made, and, since it's made of real leather, doesn't have any of the weird factory scent that comes with many synthetic leather or PU bags. It's a good size, with a height of about 9.8" and a width of 15.7" at the top and 10.2" at the bottom. On the outside, the bag looks exactly as pictured in BagInc's photos. I noticed one major difference, however, inside the bag: while the site shows the inner lining as white, the actual product is lined with a darker, more beige-y color instead. Personally I've got no complaints about this, since I think the lining looks better this way and complements the gold hardware in a much nicer way, but it's definitely something to keep in mind if you're thinking about ordering this bag. 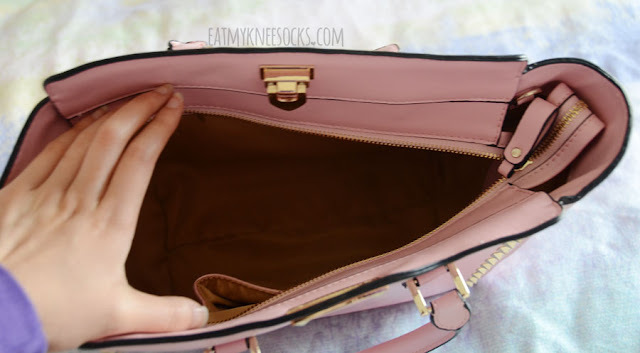 Most of the bags and purses that I have are small, cross-body or shoulder bags, and one of the things that my closet lacks is a larger, sturdy, functional bag like this one! I don't carry much in my purse usually, but if you regularly carry a lot of stuff with you, a bag like this is an absolute must-have. The zipper works well, and, combined with the flip lock, keeps everything inside safe and secure. I love that the bag comes with an attachable strap, so you can carry it like a handbag, wear it on your shoulder, or even wear it as an over-the-shoulder bag. 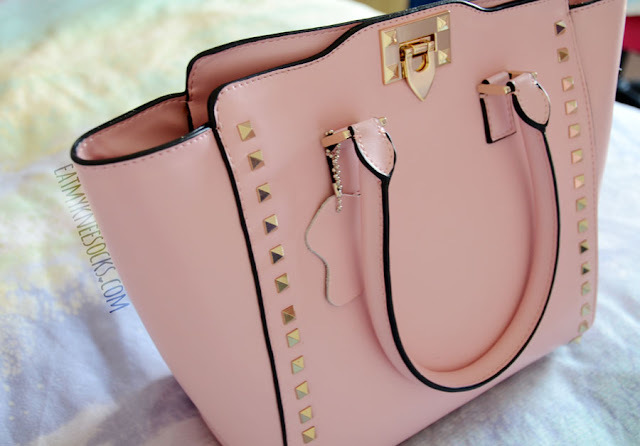 More than anything, I love the style of this bag. The light, sweet pastel pink color, especially, is just so cute and unique, and it looks 100% as expected! This Rockstar bag from BagInc is so eye-catching and stylish, yet also super functional and useful at the same time. 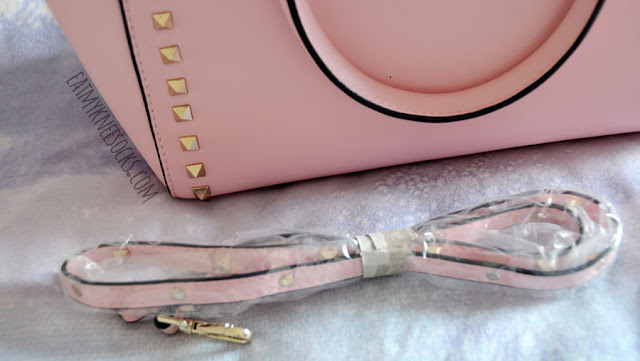 Since the color is pretty unusual, it's not the easiest bag to style, but I've found that it looks great with pastels, neutrals, and monochromatic pieces. This bag is also offered in a bright hot pink/nearly red color, if you want a stunning, bright color. Of course, if you love this style but want a more versatile color, this bag is also sold in white and camel! 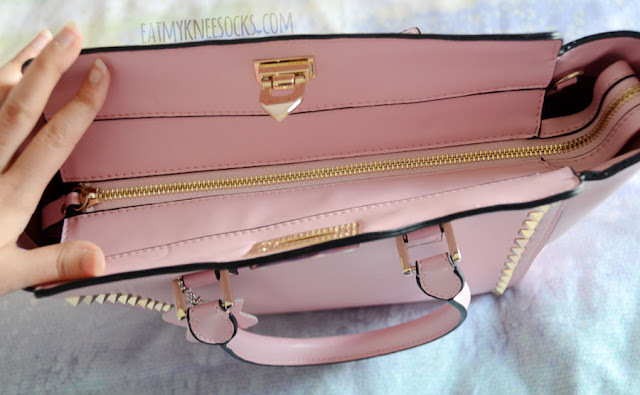 Here, I paired this Rockstar calfskin bag with a white ribbed crop top, a pink suede button-accented skort, and a clear studded choker from Milkstud (review here) for a cute pastel look, but, even though this bag has a very cute, feminine color, the style makes it perfect even for a chic, classy look. 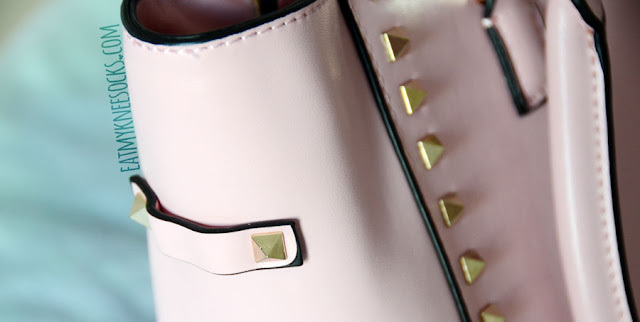 There is honestly nothing that I don't love about this pink Rockstar calfskin leather bag from BagInc! It's high-quality, real calf leather, looks nearly exactly like the photos (aside from the interior), very useful, and simply gorgeous!